Does it seem puzzling to find the term peacemaker included in a list of qualities necessary for a trusted leader? Does peace sound a bit too passive in today’s business environment? Late nights in the office. Early mornings to clear overnight e-mails. Weekends to catch up on all the things you didn’t have time to do during the week. Most people in business simply cannot work harder or faster than they are at present—we’re all sprinting just to keep up. As the old saw says, the race goes to the swift. And in the now-distant boom times, being first to market and hurrying obsessively to get out ahead made working in overdrive the norm. But in our collective rush to get ahead, maybe we have lost something…certain actions, decisions, and initiatives do have their own rhythms, and we should be sensitive to them. Don’t you agree that on some days, things just flow, while on other days, no matter how hard you push, things just don’t move forward? A peacemaker is a leader who seeks to create calm within the storms of office politics, decision making, shareholder demands, cash-flow crunches, and the endless change of things the organization cannot control such as the economy, the weather, the fleeting loyalty of today’s consumer, and a host of other constantly evolving issues. One of the jobs of a leader is to prepare the organization for times of great demand. There have been many studies on the effects of overtime work. When additional hours of work are initially introduced, productivity climbs. However, research also shows that if the overtime continues for more than about two months, productivity falls back to its original level in spite of the additional hours worked. Leaders who neglect to give the organization rest will not be prepared when the real push comes. And, in fact, they are not getting a good return on their investment by keeping everyone working long hours over extended periods of time. Leaders need to know when to let the organization (people) slow down and rest a bit so that they are ready to go when those two or three tough times during the year require that extra effort. Take a look at your world. Some people on your team are fed up with the daily push and shove. They are overworked and worn out. They feel vulnerable and fearful, and they are seeking personal peace to do a job they feel they can do but for whatever reason cannot. Peace means equilibrium, understanding, justice, mercy, caring, and harmony. To be a peacemaker means to quench the desire for revenge and replace it with the desire to put others first for their well-being. However, peacemaking does not mean seeking peace at any cost, for the peacemaker realizes that peace at any price will usually result in events that are anything but peaceful. A peacemaker is not an appeaser. He or she is not a person who is easy to shove around and who refuses to take a position. We are not talking about wimpy leaders who avoid confrontation. Quite the contrary. A peacemaker understands the positive role of conflict in building a solid team. A peacemaker is one who through strength and knowledge establishes good relationships between estranged parties—relationships based on truth and fairness. 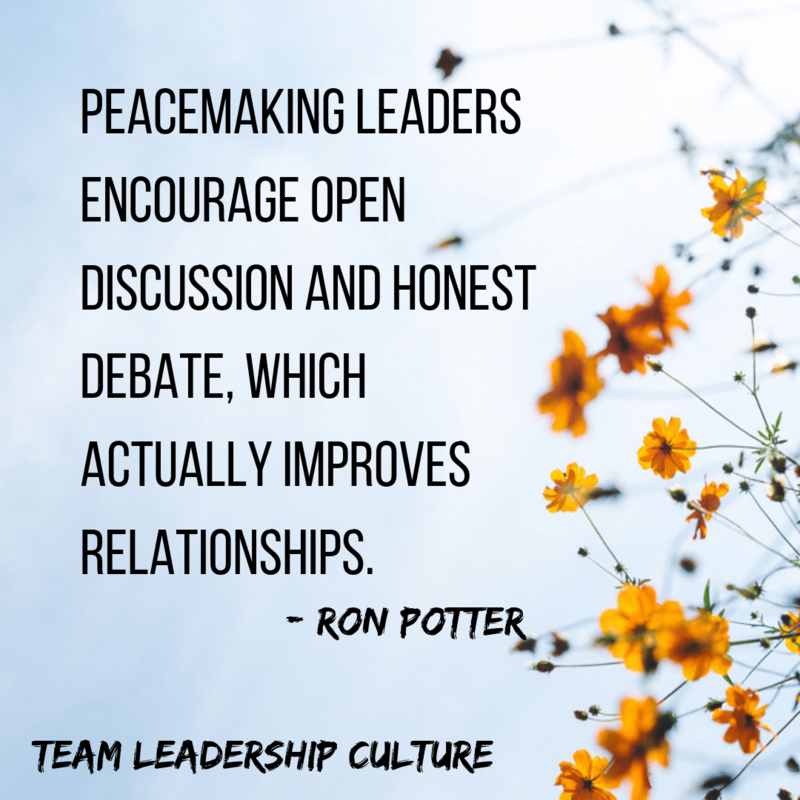 Peacemaking leaders encourage open discussion and honest debate, which actually improves relationships. Harmony comes from the trust that is developed, not from the suppression of discussion and debate. In fact, great peacemaking leaders create more energized debate than normal.